The People’s Christian Fellowship Choir is a group of vibrant singers and musicians who share their faith in God through music and song. 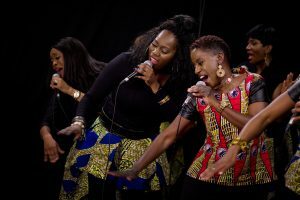 Their music style ranges from traditional gospel, gospel praise and worship, through to inspirational and gospel rock. The PCF Choir’s music appeals to a wide-ranging audience. However, its emphasis is on the positive message of God’s love and their personal relationship with Jesus. What makes the PCF choir unique, is its audiences varying ages and backgrounds. The choir was founded in 1991 and consisted of the youth who attended the PCF church. The London Community Gospel Choir, James Cleveland, John P. Kee, Ricky Dillard, Mattie Moss Clarke and many of America’s leading gospel choirs were important influences to the PCF choir during its infancy. These influences have facilitated the continuous development of the choir’s vocal abilities to a professional standard. Their passion, hard work, determination and dedication have contributed to the sustainability of the PCF choir. A testament to this is that many of its founding members are still active singers in the choir today. This commitment and passion for excellence have contributed to the distinctive blend and overall sound of the choir. Many of the PCF choir members work as session singers for other recording artists and prominent gospel groups. 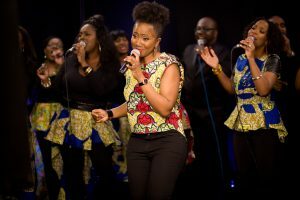 Some are recording artist in their own rights such as members of the UK Gospel Soul group – V9 Collective, who won the UK gospel music award for best group in 2010 and were also nominated for a MOBO award in 2012 for Best Gospel Group. Members of the choir regularly lead praise and worship at PCF and are often invited to attend concerts, conferences and sing at events nationally and internationally. In 2013, the choir featured in the BBC’s first ever gospel Proms held at the Royal Albert Hall, and members participated again in 2016. In September 2002, the PCF choir achieved one of its objectives of producing a live CD recording. It was a phenomenal event of praise and worship expressed in one of the most vibrant and exciting evenings. ‘Praise Comes First’ contained mostly original material recorded on the night – such as the output quality. 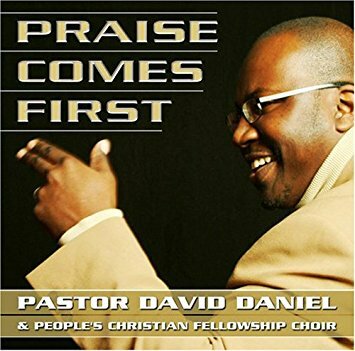 The choir’s leader, Pastor David Daniel, led the singers through the concert in a unique way; the impact of the event compelled many who attended to commit to purchasing a copy of the CD that same night! The PCF choir has gone on to produce a fantastic second live album recorded at the Dominion Centre in North London. This new album entitled ‘Great is the Lord’ is due to be released at the end of June 2017 and the first single entitled ‘Jesus’ is available now on iTunes. 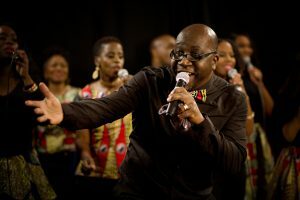 The single is a joyful proclamation of the Lordship of Jesus, co-written by Ruth Waldron, Sam Lynch and Wesley Muoria-Chaves and produced by Nathaniel Ledwidge and Wesley Muoria-Chaves. A music video has also been released to support the first single which is available to watch on the PCF website or via YouTube. ‘Great is the Lord’ features songs that encompass an eclectic range of uplifting and inspirational messages – songs of hope, declaration and praise. The singers work with a team of dedicated musicians who are innovative in their creativity and professional in their approach towards music. They, along with the choir directors and singers, work to bring a unique, universal sound which captivates listeners and draws them to a knowledge of Christ. The PCF Choir seeks to personally build their relationship with God and it is that relationship that is portrayed through this ministry. For further information regarding The PCF Choir or to book them, please contact us via tpcf.choir@tpcf.org.uk, our Contact form or telephone: +44 (0)7561 827 446.